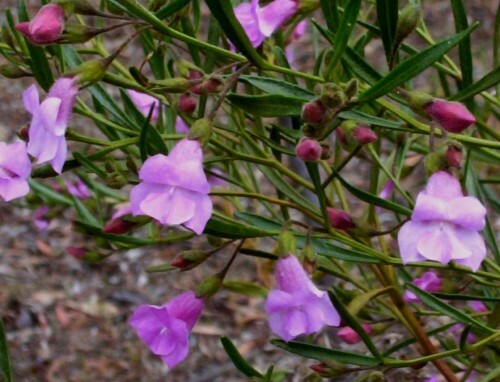 Eremophila complanata is another of those tough lime and drought tolerant plants. It is in full flower at the moment making a lovely splash of colour. Before using Australian Natives as cut flowers became more widely practised, we knew that this one kept for two weeks in a vase. It is still not on any published lists of plants suitable for the cut flower trade. When our local group of the Australian Plant Society used to organise a Spring Flower Show we got to know how many species behaved when cut for display. Eremophila complanata is a shrub to about one and a half metres, by nearly a metre wide. It would be a bit smaller if I took cuts from the bush regularly. It becomes straggly if not trimmed after flowering.